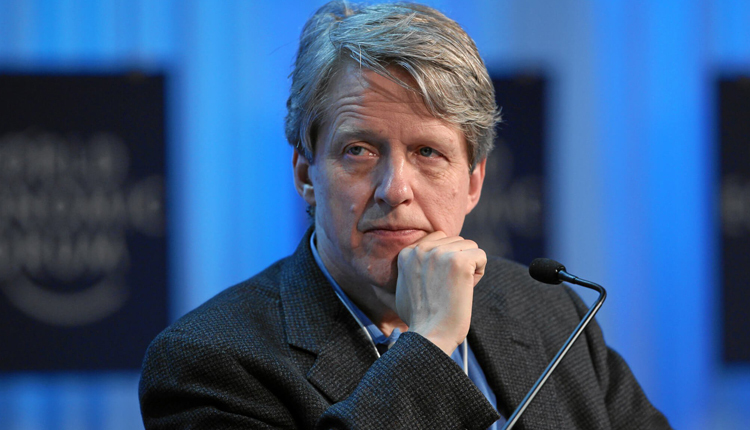 Nobel laureate and economist Robert Shiller thinks investors ought to ignore the recent burst in corporate profits and focus on longer-term valuation, which he says carries foreboding news for the U.S. stock market. At a time when earnings are rising 25 percent a quarter, Shilller said that’s not indicative of what longer-term results in the market will be. History has shown that in previous times, particularly around World War I, the late 1920s approaching the time of the Depression, and in the high-inflation 1980s, profits could be strong but equity results not as much. In the present case, the recent surge in profits has been due to last year’s tax cuts, backed by U.S. President Donald Trump, that took the corporate rate from 35 percent to 21 percent. The Yale economist is known for a number of groundbreaking views and theories on the market, but perhaps most for a gauge he uses to measure stock market valuations. The Cyclically Adjusted Price to Earnings ratio — often referred to as the “Shiller CAPE” or “Shiller PE” — looks at valuations over a 10-year period to smooth for fluctuations in the business cycle. Among other things, he said the current tax climate won’t last and corporate earnings will come back down, just as they have done in the past. Siegel is the Russell E. Palmer professor of finance at the Wharton School and has long served as the bull to Shiller’s bear. He contested several of Shiller’s points, particularly about whether the market necessarily needs to revert to trend and what he sees as an oversight on the impact of low-cost passive investing on the market. On the latter point, thanks to low-fee ETFs it now costs investors less to have a balanced portfolio so they don’t require returns as high to beat the market.